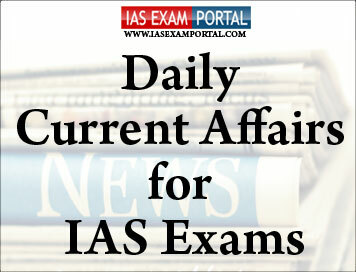 Current Affairs for IAS Exams - 28 JANUARY 2019 | IAS EXAM PORTAL - India's Largest Community for UPSC Exam Aspirants. A Pakistani delegation arrived in India on Sunday to visit the Chenab river basin in Jammu and Kashmir for inspection, as mandated under the Indus Water Treaty, sources said. “This tour is an obligation imposed on both the countries by the Indus Waters Treaty, 1960. Under the treaty, both the Commissioners are mandated to inspect sites and works on both the sides of the Indus basin in a block of five years,” a senior official said. Since the signing of the treaty, a total of 118 such tours on both the sides have been undertaken.The last tours of the commission in Pakistan and India were held in July 2013 and September 2014, respectively. The tour will be followed by a visit of India’s Indus Commissioner to Pakistan at a mutually convenient date, the official added. This tour was originally scheduled in October 2018 but was postponed because of local bodies and panchayat polls in Jammu and Kashmir. Under the Indus Water Treaty, waters flowing in three Indus tributaries — the Sutlej, the Beas and the Ravi have been allotted to India, while the Chenab, the Jhelum and the Indus waters have been allotted to Pakistan. With 75.7% schools – a marginal increase from 75% in 2016 – having usable toilets for girls, Sikkim performed better than the national average of 66.4% last year. But the State’s show was overshadowed by the less-than-satisfactory performance by seven other States in the region. Nagaland was the next best State with 47%, an increase from 40.9% in 2016, followed by Mizoram with the highest percentile increase from 25.3% to 34.9% in these two years. According to the report, 2018 completed eight years of compulsory schooling for the first cohort of students to benefit from Right to Education Act 2010. “Nationally, substantial improvements are visible over this eight-year period in the availability of many school facilities mandated by RTE. The fraction of schools with usable girls' toilets doubled, reaching 66.4% in 2018. The percentage of schools with books, other than textbooks, available rose from 62.6% to 74.2% between 2016-18. Concerned over a decline in GST revenues, tax officials are likely to examine the high usage of input tax credit (ITC) to set off tax liability by businesses, sources said. During the meeting of the GoM, it was pointed out that as much as 80% of the total GST liability is being settled by ITC and only 20% deposited as cash. GST revenue has averaged around Rs. 96,000 crore per month so far this fiscal and this reflects the cash component being deposited by businesses. The relief package is seen as an attempt to assuage the farming community’s discontent ahead of the general elections.Meanwhile, the Cabinet meeting scheduled for Monday, has been deferred, as per sources. The Agriculture Ministry has recommended several options to provide both short and long-term solutions to address agrarian distress. However, a final call will be taken at the Cabinet meeting as a huge cost is involved, they said. There is also a proposal to completely waive premium for insurance on food crops. The Centre is also evaluating the scheme followed by the Telangana and Odisha governments wherein a fixed amount is transferred directly into the bank account of farmers, the sources further said. Relations between India and UAE are going through a ‘golden era’ as both countries continue to explore deeper cooperation in the new areas. Addressing the august gathering on the occasion of the 70th Republic Day reception hosted by the Indian Consulate in Dubai, Ambassador NavdeepSuri said that the bilateral relationship between the two countries have matured and transformed into a comprehensive strategic partnership over the last few years and are at their best ever. The deepening of the energy ties, the Ambassador said, was a highlight of last year, as the relationship transformed from a buyer-seller relationship to that of a strategic partnership in energy security. He Continued, with the Abu Dhabi National Oil Company (ADNOC) is delivering the crude oil for storage in Mangalore Strategic reserve and a consortium of Indian oil companies is acquiring 10 per cent stake in Lower Zakum Offshore oil field in Abu Dhabi. The Republic Day Reception was attended by a large number of diplomatic corps, prominent expat Indians including the three PravasiBhartiyaSamman awardee Dr ZulekhaDaud, Surender Singh Kandhari and Social Worker Girish Pant. UAE Minister for Environment and Climate Change Thani Al-Zeyoudi was the chief guest at the event. The cultural mosaic of India was beautifully showcased for the guests at the Reception. Emirates News Agency today said first meeting of the UAE-Iraq Political Consultative Committee was held at the level of senior officials of the foreign finistries of both countries. During the meeting the two sides discussed bilateral relations and means of strengthening and developing them. KhalifaShaheen Al-Marar, Assistant Foreign Minister for Political Affairs, who chaired the UAE side, stressed the importance of this round of consultations to enhance aspects of joint cooperation between the two countries. Al-Marar and NizarIssa Al-Khairallah, Under-secretary of the Ministry of Foreign Affairs of Iraq, exchanged views and political stance towards the latest regional and global developments. The two sides agreed to hold a second meeting of political consultations at a date to be agreed upon later. Microplastics are already known to contaminate the world’s surface waters, yet scientists have only just begun to explore their presence in groundwater systems. The study, published in the journal Groundwater , identified microplastic fibres, along with a variety of medicines and household contaminants, in two aquifer systems in the U.S.
“Plastic in the environment breaks down into microscopic particles that can end up in the guts and gills of marine life, exposing the animals to chemicals in the plastic,” said John Scott, a researcher at the Illinois Sustainable Technology Center. “As the plastics break down, they act like sponges that soak up contaminants and microbes and can ultimately work their way into our food supply,” said Mr. Scott. Groundwater flows through the cracks and voids in limestone, sometimes carrying sewage and runoff from roads, landfills and agricultural areas into the aquifers below, he said. Malaysia has been stripped of the right to host the 2019 World Para Swimming Championships for threatening to refuse to allow Israeli athletes to take part, the International Paralympic Committee said. The decision was taken “after the Home Ministry of Malaysia failed to provide the necessary guarantees that Israeli Para swimmers could participate, free from discrimination, and safely in the Championships,” the IPC said. The championships, a qualifying event for the 2020 Tokyo Paralympics, were due to take place in Kuching on July 29-August 4. Israeli Foreign Ministry spokesman Emmanuel Nahshon called it “a victory of values over hatred and bigotry”. Malaysia’s Youth and Sports Minister Syed Saddiq Syed Abdul Rahman said if hosting an international sports event was more important than the country’s support for the Palestinian cause, “(it) means Malaysia has truly loss its moral compass”.